Built tough for a lifetime, Grizzly Coolers focuses on features you will not in any other cooler. Roto-molded double walled shells encase 2 pounds of Ecomate foam for tough and rugged use, while rubber latches keep a sturdy, secure grip. The mold-in handles and hinges with solid stainless steel pins are for extra strength and easy handling. Furthermore, 2 inch tie-down slots are built right into the cooler. The oversized 2-inch drain with 2-1/4 inch drain channel makes emptying the ice chest easy, and the thick rubber gasket makes for a perfect seal. 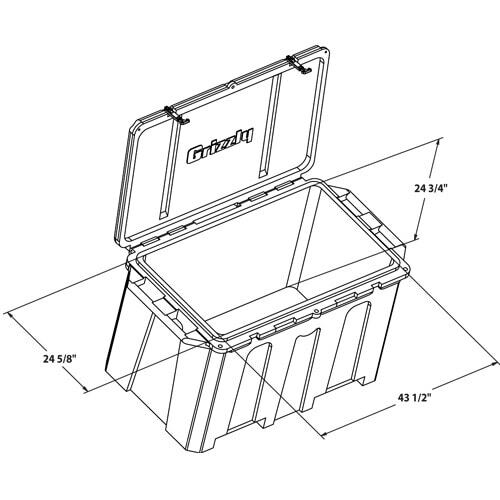 Add in an embossed 30 inch ruler on the lid, a rope handle with nylon-sleeved rubber handle, environmentally-friendly pressure-injected insulation, non-slip no-mark rubber feet, BearClaw latches for a secure grip without needing hardware, and full length drain channels for a complete empty, and you ve got yourself a phenomenal cooler built with you in mind. Grizzly Coolers, true to their name, meet IGBC Bear Resistant Certification 3362 - rest assured that your cooler is tough enough to fight a bear to a stalemate! This ice chest is large enough to hold: 500 - 12 ounce cans; 300 - 12 ounce bottles; 200 - 20 ounce bottles; 350 pounds of game. 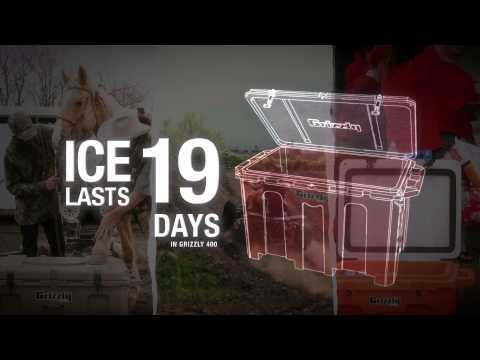 Made in the USA, this 400 quart Grizzly cooler keeps ice cold for up to 19 days and 10 hours with the thick rubber gasket seal and insulated rigid lid. Grizzly Coolers have a lifetime warranty against any manufacturing defects.